You may have noticed different printing terms used on our website and in the industry. 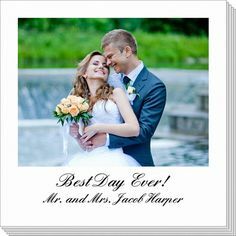 There are a number of different methods for printing stationery, invitations, business cards and more to achieve a particular look and feel. One method is not necessarily any better or worse than another. They are a personal preference. But for those that love the world of stationery, here are some main details that differentiate between the mainstream printing styles. The process to create an embossed image is to create a metal die of your imprint, whether your imprint is a name or monogram or design. That die is pushed from the bottom up into the paper to create a raised image. You can feel the image when you rub your hands over the stationery. The note cards are done one by one for this special process. You may have heard the term blind embossed, which simply means the imprint has no color, it’s simply the crisp imprint pushed into the paper stock. 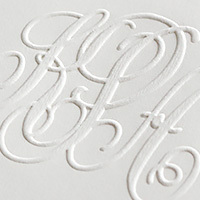 Embossing can be on white or ivory paper stock but can also be on colored stocks. 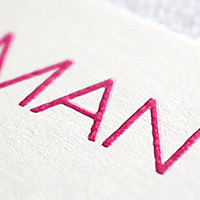 Embossing creates an understated, elegant image perfect for everything from business use to social use. The process of thermography was developed to achieve a less expensive version of engraving. To create this look the imprint is printed on the paper stock with ink and, prior to the imprint drying, a very fine powder is sprinkled over it. The paper is then placed in a heated oven to set the powder and dry the ink which leaves a slightly raised, slightly shiny imprint. The powder is then wiped clean from the paper stock leaving a very sophisticated look and feel to the product. 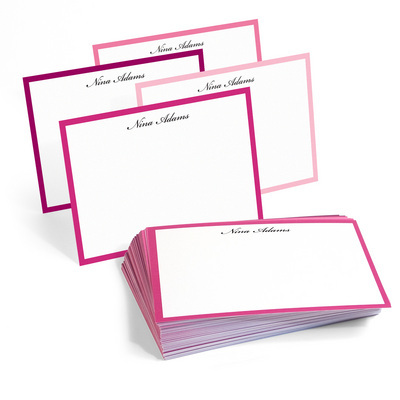 The process of thermography is perfect for note cards, letter sheets, invitations, business cards and thank you notes for formal events, everyday social use and for business. As its name implies, with flat printing the ink lays completely flat on the surface of the paper. 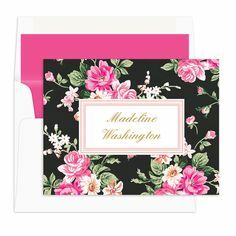 It is the most popular style of printing and is used on almost all notepads, most holiday cards and many types of note cards. Flat printing can create rich, stunning colors and patterns. Flat printing can be done on either traditional offset printing presses or modern digital presses. It is neither raised like thermography nor depressed like letterpress. 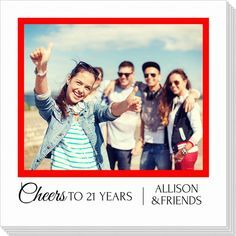 Flat printing can be used for everything from single color imprints all the way up to full-color photo reproductions. These printers are run by highly trained press operators to bring complex and colorful designs to life. With a desire from designers to print gorgeous full-color patterns and imprints now greater than ever, flat printing is the perfect solution. 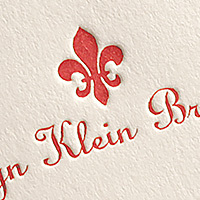 Adding some shine to printed paper stock is referred to as foil stamping. The process of fusing foil to paper can create beautiful accents on stationery, invitations and holiday cards. For a touch of shimmer a metal die of the desired imprint is produced. The die is used to push a thin sheet of foil into paper stock through a process of pressure and heat which leaves the desired foil imprint fused onto the paper. Foil for this purpose is available in many colors. 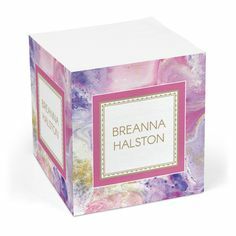 A real foil accent can add a brilliant touch to personalized items. There are also many items which use a matte foil. This technique is very useful for printing lighter colors over dark paper. To create a letterpress imprint, a metal die is created and a specific type of quality soft cotton paper stock must be used. The die is positioned in a special press for this process. 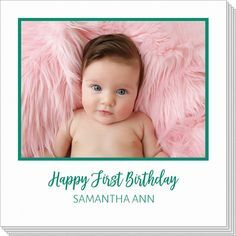 As the paper moves through the press, the ink color is pushed directly into the elegant, paper stock, from the top of the card down, to create a crisp impression and an elegant feel. This is an old world process and requires a specialty printer to accomplish it correctly. When you rub your hands over an item created via letterpress you will feel a depressed imprint. 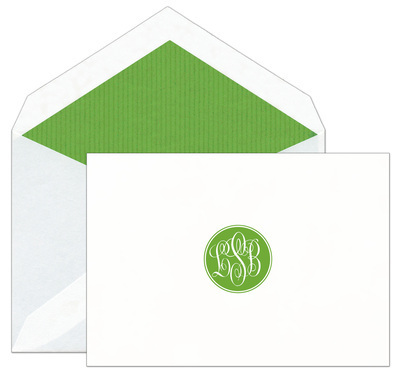 Letterpress stationery, invitations and other items denotes personal and professional style. The color, weight and texture of the paper are all part of the presentation. 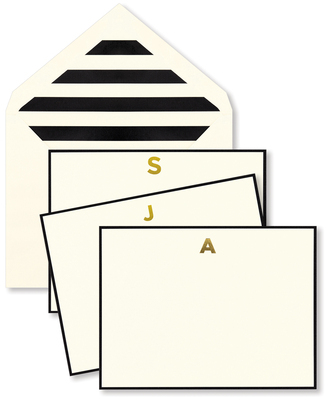 Letterpress items add a rich impression to stationery, business cards, invitations and more. 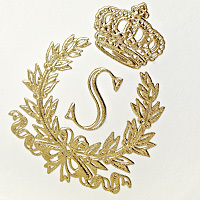 Every sheet of stock is pressed individually for a subtle but exquisite touch of luxury. Typically letterpress is done in one color imprint but a two color imprint is available which requires two metal dies and two passes through the press. This is one of the oldest and most elegant methods of printing. Specifically, engraving starts by creating a reverse etching of an image onto a copper plate. 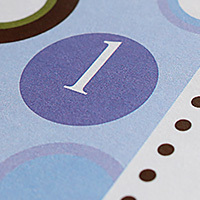 Then, ink is applied to the plate and paper is pressed into it, creating a raised image on the front of the paper stock. 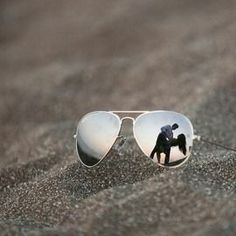 The process of engraving can print gold, silver and other metallic ink colors, a light colored ink on a darker colored stock, or most any other colored ink on a lighter colored stock. You can tell if an item is engraved as you can feel and see a slight indentation on the back of the item where there was pressure on the stock. 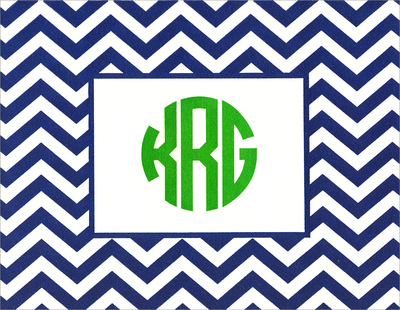 Engraving can be done on products from note cards to invitations business cards. It is a manual hand-process. Each time the stock is pressed, a new piece needs to be fed into the machinery by hand. Engraved items will be more expensive than thermographed product as there needs to be a metal plate produced and, as mentioned, the printing process is manual. However, plates can be used over and over again reducing that initial investment. 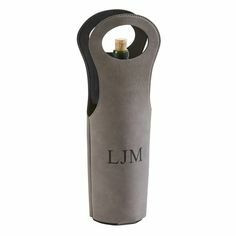 If you are someone who appreciates an elegant product, engraving may be a perfect option for you. Stay on the Nice List! This holiday season, try to stay on the nice list by promptly writing your thank you notes for all the gifts you receive. In the era of everything digital, a hand written thank you note really makes an impression! The Stationery Studio has oodles to pick from, but here are a few of my favorites. 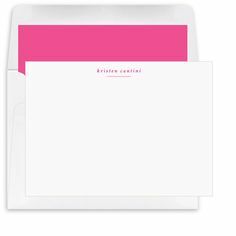 Stock up on personalized thank you notes now so you have them beyond the holidays as they can be used for any moment a thank you note is appropriate. Comments Comments Off on Stay on the Nice List!